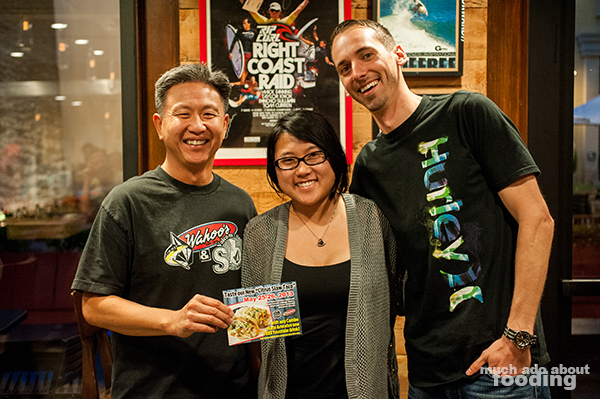 25 years ago, the three brothers Eduardo Lee, Mingo Lee, and Wing Lam decided that they were going to start up a restaurant in Costa Mesa that gave them the freedom to continue surfing (three owners allowed for one of them to be off at the beach at any point, Mingo told us, haha) and put together food they loved. 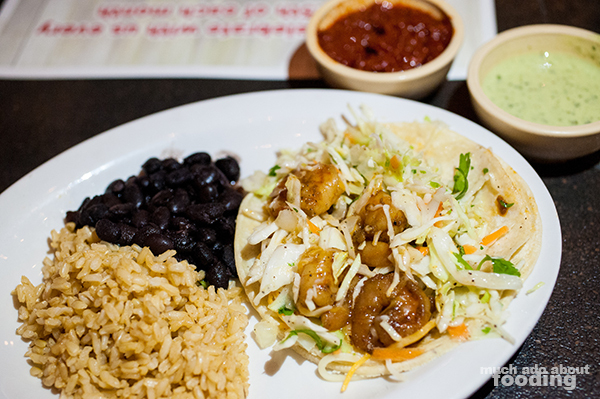 A Brazilian and Asian flair was tacked onto Mexican dishes to create Wahoo's Fish Taco, the first of which was right here in Orange County in Costa Mesa. In 1988 when they first opened their first store, I don't think they were expecting that twenty-five years later, there would be nearly 70 stores nationwide with plans for an international location in mid 2013. So what was I doing there the other day? I don't think it's often that I write-up about any chain but despite the franchising that has happened, the product and business is still primarily family-own and run. 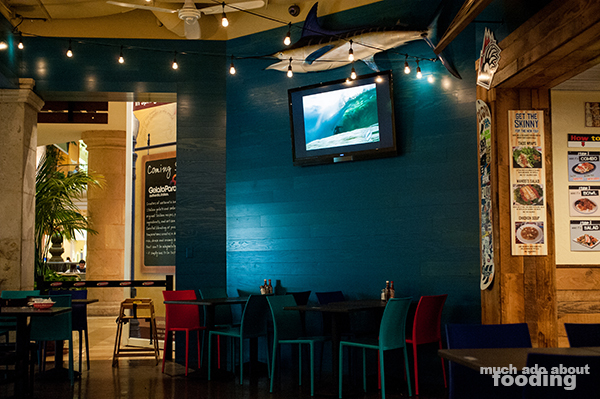 The menu items and Hawaiian North Shore vibe stay constant throughout the locations because of the family's involvement. We went to the Newport Beach Fashion Island location to celebrate their 25th anniversary with them which kicked off with a special event/announcement every month of 2013. This time, we were there for their Citrus Slaw, available on May 25th. 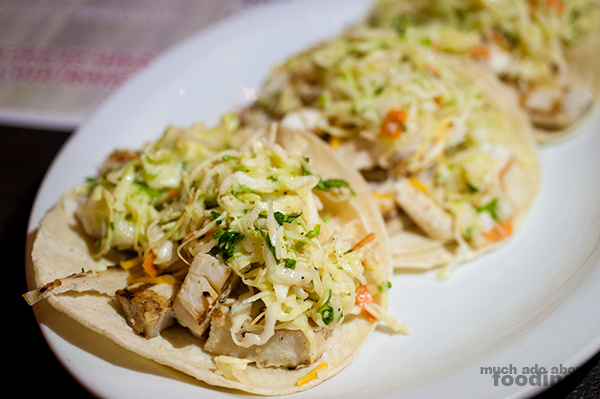 That whole weekend, ordering citrus slaw atop your taco in a combo meal will earn you a free fountain drink too, wahoo! This is for every location on the 25th and 26th. 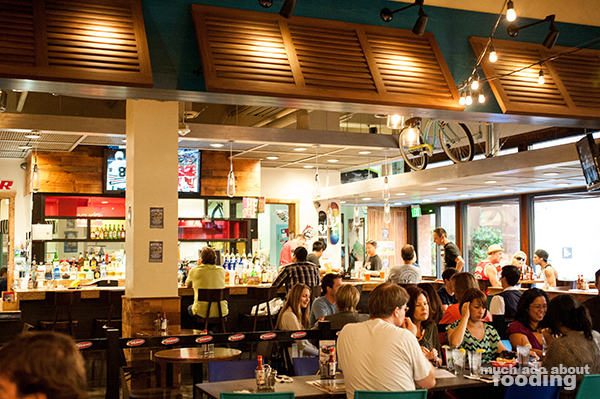 Despite this NB location's position in the food court of Fashion Island, it boasted a full bar where we previewers could also see what concoctions were made behind the counter. It also had the familiar walls in the back where people could stick stickers. 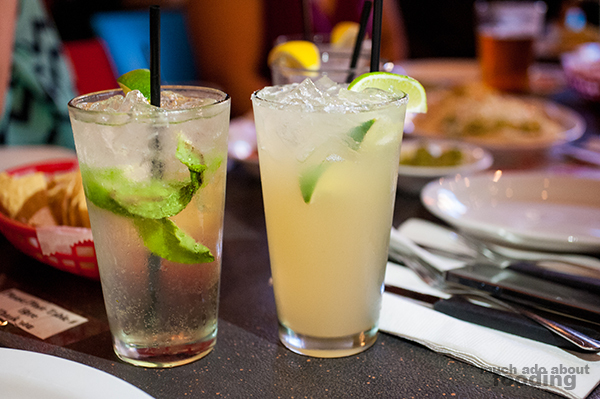 With a Mexican Mojito (a bit sweet because of the agave nectar used) and Wahoo's Margarita (tasty!) 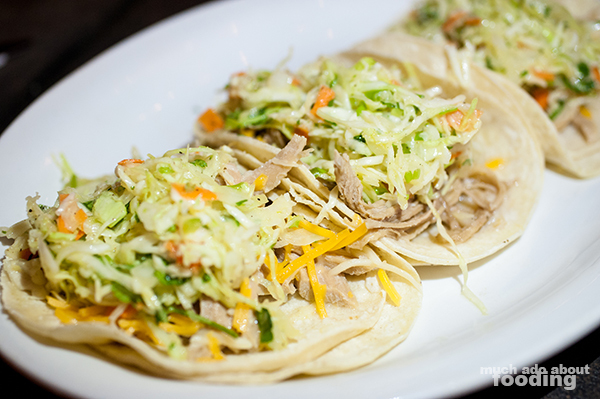 to lubricate our throats, we looked forward to the citrus slaw on the tacos and the accompanying sides. 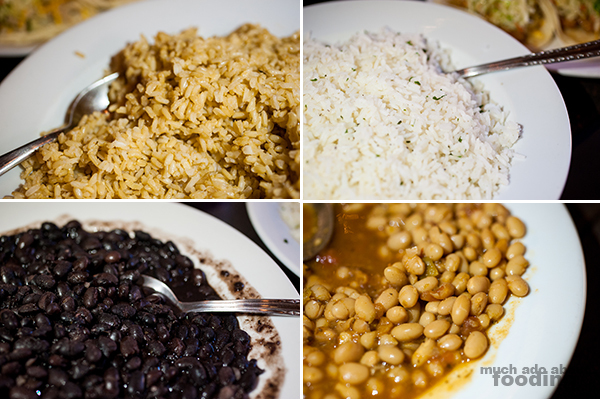 Fluffy rice both brown and white met with two types of beans served as perfect fillers for a full meal. They would be options for your combo meal when you order it! As for the citrus slaw, well, that's a tasty mix of cabbage, cilantro, onions, and carrots tossed in lime juice and olive oil. It's so timely for this time of the year too. Refreshing, tangy, and bright, this was a slaw to enjoy either atop your choice of protein or alongside anything really. Like I said, it's to be released on the 25th of the month as are all of their other monthly promotions. 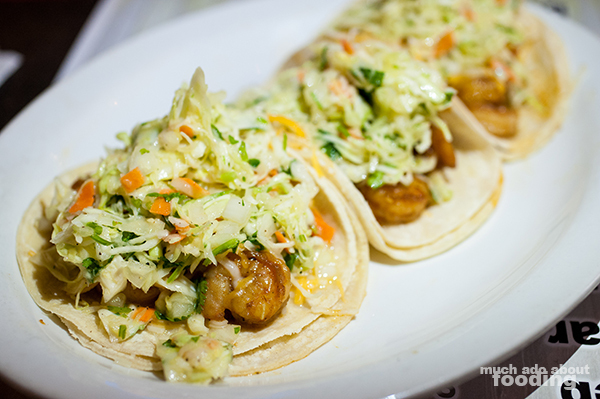 The options we got to try with the citrus slaw were the fish, chicken, carnitas, and shrimp tacos. The fish was fantastic with the slaw; seafood almost always goes well with some tanginess. The slaw was light enough to let the fish flavor shine through. 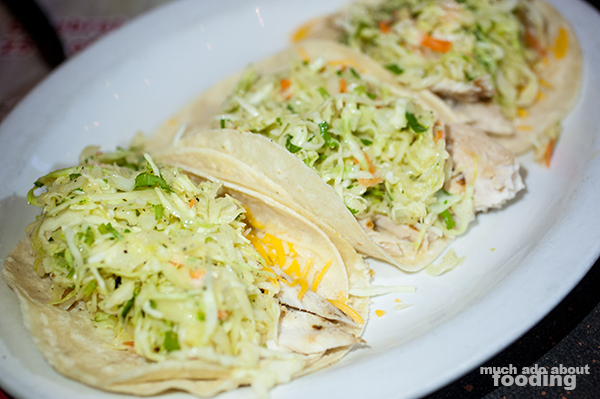 The chicken came in well-sized pieces to nosh on in the tacos. The carnitas were a favorite of some at the table with its slow-roasted flavor and slight saltiness. Overall, I think the most favorited though (include my own favorite) was their shrimp in its Wahoo's teriyaki marinade. The shrimp was cooked just perfectly through with enough structure in the flesh and yet softness to the bite. The marinade really added the best flair to the already well-done seafood but paired with the citrus slaw, it made so much sense. That one gets my recommendation if you make it out to try their slaw this weekend. Get the shrimp! Additionally, we got to taste their green sauce (cilantro, yesssss!) and the Mr. Lee's Chili Sauce. Bet you didn't know what that was, huh? It's not one that is very publicly popularized but boy oh boy did we all enjoy it at the table. Made from the recipe of the brothers' own father, Mr. Lee's Chili Sauce was a thick spicy paste that included sweetness from hoisin sauce (tamarind-based) and went very well with just about everything we put it on. It had a slow burn that lingered in our throats after we finally stopped eating it but not one that was unbearable. Apparently, you can also make your order with the sauce as part of your protein's marinade (whoops - that's a secret but you readers can hear it from me...just don't go overboard and overwork the Wahoo's staff at your location, hah). Give it a shot first before you go ahead and incorporate it into everything though honestly, that wouldn't be a bad idea. I loved hearing the story of Wahoo's as told by Mingo who graced us with his presence. 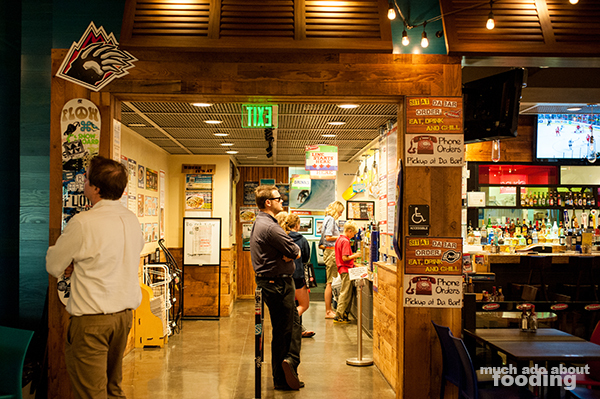 Keeping to their roots but also expanding and making every location a part of the local community, Wahoo's is a fine example of a success story. They've even branched out to include some vegetarian/vegan options as that lifestyle choice has become more popular (apparently everyone needs to try the blackened mushroom enchiladas with green sauce!). I think that with 25 years under their belt, they've got a fantastic system down pat. Thanks to Wahoo's for having us, Mingo & Kevin for enlightening us with how it all came to be and plans to pan out to be, and the supporters who have allowed this business to thrive. Happy 25th!